Come join the Rainbow Warriors to round off Hamilton Pride week with a Lip sync competition, and of course a dance party with a Dj. Entry $5 waged, $2 unwaged, gets you a chance to win a fabulous door prize. Solo,duo,group acts are welcome to enter! must register via email – [email protected] or on the night, get in quick as entry numbers are limited!. Plenty of parking, food, free pool & full bar facilities available, bring your dancing shoes to boogie the rest of the night away. Rainbow Warriors – Hamilton Women’s Softball Team. 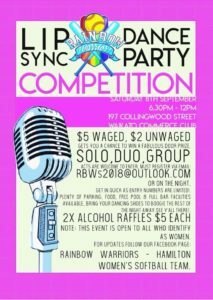 Lip Sync Dance Party | Saturday 8th of September | Commerce Club Hamilton | 7pm – 12pm | $5 Waged | $2 un-waged | Rainbow Warriors – Hamilton Woman’s Softball Team | See you there!